Welcome to Boston Mamas Rock! – where I share the voices of fabulous local mamas from all walks of life. Read on for today’s interview with Tori Stuart, mother of two and founder of locally based natural food company Zoe Foods. Then go ahead and nominate a fabulous local mama! Christine: Welcome, Tori! You’re a mother of two and the founder of Zoe Foods, a natural food company. Before we chat about your business, let’s back up. Can you tell us a little bit about what you were up to before launching your company? Tori: I’ve always wanted to start my own business. I had lemonade stands when I was little, sold painted barrettes to local retailers in high school, and started some other small businesses while in college too. Right out of college, I sold advertising space and ran promotions/events for a couple of NYC magazines. Then I worked for two large advertising agencies in New York City (Grey Advertising and J. Walter Thompson). Just before I started Zoe Foods, I spent six years as a consultant where I learned about many different industries and had the opportunity to see how a small company was run. Christine: One of your nominators described that your business was inspired by your mother; specifically, that you “saw the need for menopausal women like [your] mom to get more flax in their diet to minimize hot flashes” and that you decided to create all natural products using a similar recipe to what your mother was making for herself. It’s one thing to want your loved ones to eat better, but it’s another to create a product for mass consumption. What inspired you to go big? Tori: I figured that if one person had a problem that needed to be solved, the odds were that many others were confronting the same challenge too. Since I knew I wanted to start my own business, this became the basis for founding Zoe Foods. When the company began, we produced a granola designed to help reduce the frequency and intensity of peri-menopausal hot flashes with about a tablespoon of ground flaxseed and about 5 g of soy protein per serving. As natural foods became mainstream, we broadened the positioning of Zoe’s Granolas and Bars to include all women and their families, not just peri-menopausal women. After all, 100% natural ingredients, whole grains, ground flaxseed, fiber, protein, and omega-3 fatty acids are healthy for everyone. Christine: Two of your nominators mentioned weight loss in relation to your product. Tell us more about this. Do you specifically advocate your product in conjunction with eating wellness plans? Tori: I did not create Zoe’s Granolas and Bars with the specific goal of helping people to lose weight, or even as part of a weight loss program. Zoe’s Granola was designed to help mitigate hot flashes. To our surprise, consumers started writing in that they were losing weight since they had started eating Zoe’s Granolas and Bars. We have since concluded that because our products are high in fiber, with 7-8 grams of protein and 100% daily value of omega-3 fatty acids, people are actually satiated after a serving. So, they don’t tend to snack and have often replaced a higher calorie alternative with Zoe’s Granolas or Bars, and as a result, lose weight! Consumers wrote in about this so often, we decided to create a healthful meal plan of our own. In conjunction with a nutritionist, the Zoe Foods Healthy Meal Plan was born, and is available free on our website. Christine: I love that you are an independent, local company but obviously it must be a tad intimidating to compete with larger competitors for grocery shelf space. Do you have a marketing team? How do you make your product stand out from the rest? Tori: It’s not really intimidating, but rather frustrating. My marketing team consists of two people, me and my marketing director. Since we cannot compete with the large companies on consumer advertising, we use grassroots marketing. This means getting the word out through sampling, word of mouth, publicity, and now, social media. It is particularly difficult in this economy because retailers are less willing to take a chance on stocking a smaller brand that doesn’t have deep pockets for consumer marketing. For this reason, we are building our online sales and now do a healthy business with Amazon.com and our online store! Zoe Foods products have always stood out from the competition based on their superior nutrition facts and great taste. We find that people buy Zoe’s Granolas and Bars the first time for the nutrition, the second time for the taste, and the third time for life! Christine: You have two daughters. 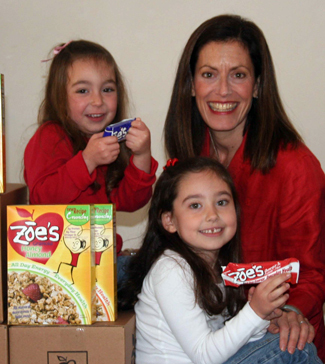 Tell us where you were with the development of Zoe Foods in relation to the arrival of your children. Tori: When I started Zoe Foods I wasn’t married and didn’t have children or a dog. I worked around the clock and it’s hard to imagine being able to go from concept to a product on the shelf in fourteen months with a family to care for. However, I did have my first child just one year after Zoe’s Granola hit shelves, and then had my second child 17 months later! So other than the first year, I have always had to juggle Zoe Foods and my family. Christine: What has been the most challenging thing about being a mamapreneur, juggling the high demands of your business with family life? Do you have any nuggets of wisdom for aspiring mamapreneurs? Tori: The most challenging thing is definitely having the energy to juggle all the demands of business - from managing my team to overseeing sales, operations, and finance - while still making quality time for my family a priority. I find that I used to think of myself as well organized, but being a mamapreneur certainly puts my skills to the test. My nugget of wisdom may sound trite, but I have found it to be both true and extremely helpful: Don’t sweat the small stuff because life is too short and too precious. The important things always seem to get done! Christine: It must be particularly meaningful to have a business centered around women’s health, given your mother’s inspiration and the fact that you have two daughters. Do your girls have a sense of what it is that you do and how it impacts women’s health? Tori: My girls, now ages 6 ½ and 5, certainly grasp the understanding of what’s healthy and what is not, as far as food goes. As for a better understanding, they’re just too young. However, both my girls know that their mother works and makes a product that they can find in grocery stores like Shaw’s, and they know that this is very different from their friends’ mothers. I think there are times when they feel proud and others when they wish I was available to pick them up from school, like the other moms do. Christine: Your motto is, “Keep dreaming, keep believing, keep achieving.” What’s the next thing – personal or professional – on your wish list? Tori: One of my dreams is for my family and my sister’s family to take six months off to sail and explore while we home school our children. Tori: From the above question, you probably have already gathered that I like to travel and to sail. I also love skiing, hiking, biking – basically anything outdoors. Photography has been a lifelong hobby and I enjoy seeing my five-year-old taking to it as she composes still life photo shoots with her stuffed animals that she’ll shoot with my old digital camera! Tori: What’s not to love? We have access to the culture of the city and the quiet of the country, while being near the ocean and the mountains. Who could ask for anything better?